Have I mentioned before how much I love making dinners that use rotisserie chicken? 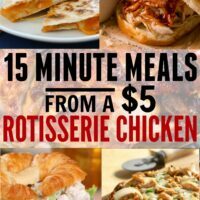 I know I’ve used it before here in this recipe, and talked about it again here, so I think it’s pretty well-documented that I’m a big fan of rotisserie chicken cooking. 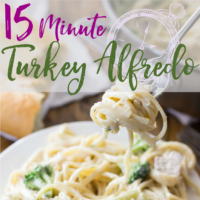 I’ll often stop at the store and pick up a pre-cooked chicken from Wegman’s for a last minute dinner for $5, and then I can get at least one whole meal out of it, all without ever turning on my oven! There are so many different ways to season and serve the chicken, too, so it never gets boring for my family. 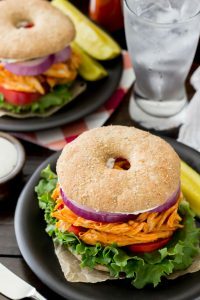 These buffalo chicken rotisserie chicken bagel thins might be my favorite way to use up this chicken, and they’re frequently making rotations in my dinner menu. They are easy little sandwiches that I’ve been making for years. I got the idea after seeing pretty much the same sandwich at an Einstein’s bagel shop forever ago, only they wanted $5 for the sandwich alone. I figured I could make them by myself for a fair bit cheaper, and of course that turned out to be the case! 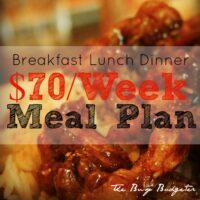 Making them yourself with a store-bought chicken brings the total per person to about $2 a person, and that’s a much better deal, if you ask me. Pick your chicken, measure your buffalo sauce, and slice your toppings (we use lettuce, tomato, and onion). If the cream cheese is too cold, I’ll sometimes put it in a small dish and warm it for a few seconds to make it easy to spread without risking tearing the bagel thins. 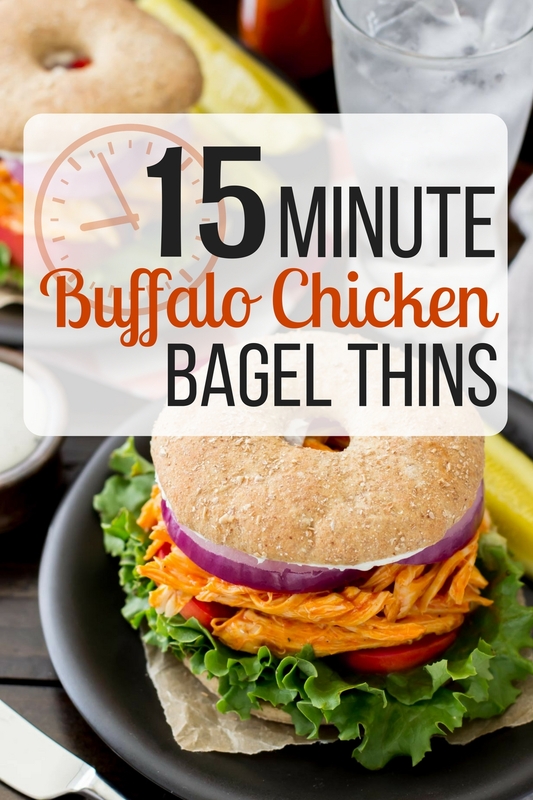 I always buy whole wheat bagel thins; usually some family members will grumble about whole wheat things, but with these buffalo chicken bagel thins there’s so much flavor between the buffalo sauce and cream cheese that I’ve never gotten a complaint (I don’t think they even notice, actually). Place your chicken in a medium-sized bowl and use a pair of forks to shred it a bit more if your pieces are still too large. Then, add your buffalo sauce. Toss everything together really well until the chicken is completely coated, and warm everything in the bowl to keep things nice and toasty. 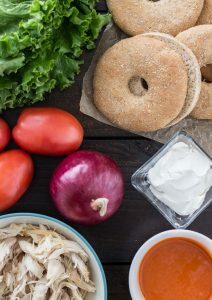 Instead of ranch dressing or mayo, you’ll spread cream cheese over the bagel thin, and it pairs so perfectly with the warm buffalo chicken and lightly toasted bagel. 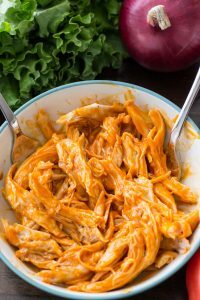 I think it might actually be the cream cheese and not the buffalo sauce that makes this one of my favorite easy meals (or, more likely, it’s the pairing of the two!). And that’s it! I hope you love these easy, flavorful sandwiches as much as I do! 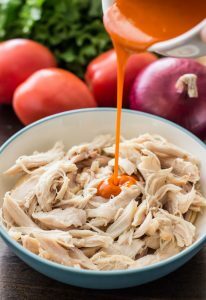 In a medium-sized, microwave-safe bowl, combine shredded chicken, buffalo sauce, and pepper. 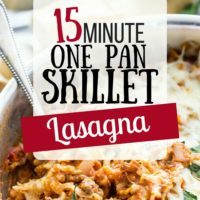 Heat in microwave for 1-2 minutes (until warm), and set aside. Evenly spread cream cheese over the inside of the top half of each bagel, evenly dividing among bagels. Place one lettuce leaf on the bottom half of each bagel. Top with tomato slices. Neatly heap shredded chicken on top of the tomatoes, evenly distributing meat. Top chicken with onion slices and then top with cream cheese covered half of bagel thin. Do you take these images yourself? If so, what equipment do you use? Perhaps you can do a post on it!